When my first son was born I had his birthday party planned weeks in advance. I made cute little invitations and I invited his little one year old friends to join us for the celebration. He had a baseball themed birthday party, complete with popcorn, hot dogs, and little rice crispy treats decorated like baseballs. Poor little A was not quite so fortunate. The busy-ness of daily life caught up to me and before I knew it, it was the week before his first birthday. I had not bought a single present. I had not thought out a cute theme. I had not invited a single friend. I guess that’s just the plight of the middle child. 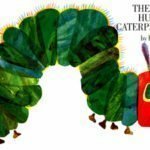 I started brainstorming some cake ideas and I decided on the “Very Hungry Caterpillar” by Eric Carle. I knew that I wanted him to have his own cake to smash, and I think cupcakes are just so much easier to eat and enjoy. So this is what my mom and I came up with. I used a six inch cake pan for the head and 15 standard cupcakes for the body. We bought plain vanilla butter cream frosting (don’t use the whipped, it’s too hard to mix the colors) and then dyed it with gel food coloring. We did buy a tube of red decorating icing to mix with the frosting to help get the red color for the head (that helped it from looking pink). We decorated the cupcakes with some green sugar crystals and some green glitter decorating gel, and some we left plain. We mixed to different shades of green – one darker, and one with a little more yellow. For the antennas I used a red Twizzler that was cut in half. I piped the face onto the cake with some additional butter cream and a bit of the green glitter gel. I used a wooden #1 that I bought at Hobby Lobby. Even though I didn’t have a lot of time to prepare, I think the party was a lot of fun. It was just our immediate family and my mom and dad. Little A gave the cake his stamp of approval. It’s hard to believe that he’s now a year old. This last year has just flown by sooo fast. He’s such a sweet kid. I’m so glad to be his mommy. Happy Birthday A! We love you! *This post contains Amazon Affiliate links to help you find the materials I used in the making of the cake. 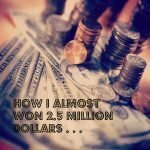 How I almost won $2.5 million dollars from the Publisher’s Clearing House . . .
@Tiffany – oh gosh no – I hardly have time to bathe as it is. Although we do plan on having more in the future maybe in another year or two 🙂 I just know that growing up my sister claimed that the middle child was always forgotten.